Parvo is very contagious and one of the most common viral disease in dogs. It affects mostly puppies under 6 months old, because of their immature immune systems. There are 2 main forms of the virus -- one being cardiac and the other being intestinal. The intestinal form is the most common, called Interitus. The virus attacks the rapidly dividing cells of the intestinal lining, which is why growing puppies are the most effected. The majority of cases occur in puppies under 6 months old, with the most severe cases usually occurring in puppies around 12 weeks. This horrible virus first became known around 1978, and until 1980 the strain wreaking the most havoc was Type2 (CPV2), until a 2nd strain came on the scene (CPV2a). Then around 1986 a 3rd strain became more prevalent (CPV2b), and is currently the most common strain to affect dogs. There has been recent detection of a 3rd strain (CPV2c), and it is still being researched. This is a disease that affects dogs only, it cannot be transmitted to humans, or even other animal species. However humans and other animals such as birds and rodents can help transport the virus from place to place. Under the right conditions, the virus can live up to 5 months on surfaces! The virus is essentially transmitted by coming into contact with an infected dogs feces (poop), which can happen numerous ways. Because the virus can live for months, it can be easily brought home to dogs by their humans. If you were to step in feces with your shoes, or drive over it with your car tires, you would then bring the virus to your property. If you think or know an area (yard, house, etc.) has been exposed to the virus, then everything must be cleaned with a bleach solution. A free call to any veterinarian clinic will give you the proper ratio of water to bleach mixture in order to effectively kill the virus. Symptoms will usually start to show within 7 to 14 days after exposure to the virus (called the incubation period) and can range drastically in severity. Diarrhea and vomiting cause dehydration, and they cause it fast! The attack of the virus on the intestinal lining make it very difficult for the dog to absorb hydration (water). 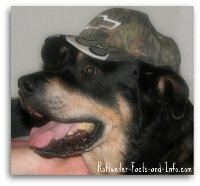 Extreme dehydration is usually the ultimate reason that dogs die from this disease. One of the main treatments is replacing fluids that are lost because of vomiting and diarrhea. A vet will usually give an electrolyte solution intravenously (through a vein directly into the blood stream), as well as antibiotics to fight off secondary infections. With immediate veterinary care, a dog can have up to an 80% chance of survival, but that's NO guarantee. This is a horrible virus that strikes fast and hard, and treatment costs can run into the thousands. Dogs who survive Parvo can get it again and tend to have a weakened immune system because of it. If your dog has survived this terrible virus, or you just want to help your dogs immune system, then natural dog immune system supplements are your best bet. The single best way to prevent this and other viruses is to make sure you get all the initial puppy vaccinations. 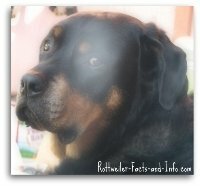 Rottweilers are highly susceptible to this virus, along with Doberman's. Most breeders will give an initial combo vaccine around 6 weeks that contains the Parvo vaccine. You should be very diligent in ensuring your puppy gets at least 3 rounds of the vaccine. The reason for 3 to 4 rounds of vaccinations is because of the "window of susceptibility" discussed on the puppy vaccinations page above. The second best thing you can do to protect your dog is to be very careful with socialization prior to the completion of his vaccinations. Also before, during and after vaccinations, be very careful about encountering the feces (poop) of other dogs. 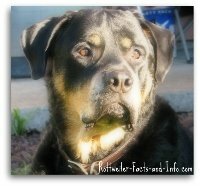 If, God forbid, you ever find yourself in a situation where your Rottweiler or other dog has a catastrophic disease such as this one, then there are two forms of financial assistance to help you. The first is pet insurance, which you must have already purchased before hand. The second is something called CareCredit. I don't think a lot of people are aware of CareCredit, including myself, until my folks had an emergency with their Australian Shepherd. When their vet (who is now mine) realized how much money the emergency was likely to cost, they promptly let my folks know about something that works much like a pet care credit card. It ended up being a financial life-saver!